Ruth Davidson has enjoyed a stratospheric rise to prominence within the Scottish Conservative Party, winning her surprise leadership victory an astonishing six months after becoming an MSP. Under her redoubtable leadership, the Tory Party have revitalised their fortunes north of the border, more than doubling their seats and overtaking Labour for the first time in sixty years. A lesbian, kick-boxing former Territorial Army reservist, Davidson has broken the mould of both Tory and Scottish politics and has been touted as a future Prime Minister. Yet little is known of Ms Davidson and her remarkable journey outside of Scotland. With Scottish politics in flux following the hard-fought independence referendum and Britain’s imminent departure from the EU, Davidson’s profile will only become more prominent as she heads up the official opposition. 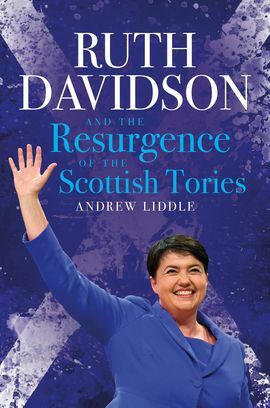 This first biography of one of Britain’s rising political stars examines how Davidson rejuvenated the toxic Tory brand and asks what the future holds both in Scotland and beyond for this extraordinary young politician. Liddle shows that Davidson didn’t have an easy time, and her first months as leader of the Scottish Conservatives was truly awful. But she learnt and become a flamboyant public personality who managed to combine her belief in a vibrant Scotland but within the United Kingdom.